Elrond was the father of Arwen Evenstar and her twin brothers, Elladan and Elrohir. He was also the Lord of Rivendell during the Third Age. Elrond and his twin brother, Elros, were born 58 years before the end of the First Age. Since chronology in the First Age is not clear, it is not known when exactly this would have been, but it was around the year 532. The twins were the sons of Earendil the great Elf-mariner and Elwing. Earendil was the son of Tuor, a man of the House of Hador, and Idril, an Elf-maiden of Gondolin who was the daughter of King Turgon. Elwing was the daughter of a Half-Elf named Dior, the son of the legendary Beren and Luthien, and an Elf named Nimloth. This made Elrond and Elros both Half-Elven, and they would both ultimately be given the choice between living an immortal life with the Elves or dying in Middle-Earth with mortal men. Elros chose mortality and he became the first King of Numenor, an island raised in the middle of the Great Sea by the Valar as a gift to the Edain, a people who had suffered greatly in the war against Morgoth. He ruled for five hundred years before his death in 442 of the Second Age. Elrond chose an immortal life and lived with another Elf called Gil-galad in Lindon. In circa 1200 of the Second Age, the new enemy Sauron, who had previously been a servant to Morgoth, took the form of a fair being and tried to enter Lindon. Elrond and Gil-galad did not fall for this and they suspected he was evil, but they did not know he was Sauron. They denied him entry to Lindon. But other Elves who lived in Eregion let him into their land, believing that he was a being of great power who could bring them prosperity. Sauron told the Elves to forge the Rings of Power, which would be used as great powerful weapons for each race who received them. The Elves of Lindon made three Rings for themselves, Seven Rings for their allies the Dwarves, and Nine Rings for mortal men. In circa 1600, Sauron forged another Ring in secret. This Ring was the One Ring to rule them all, into which Sauron poured his evil, malice, and dominance. Eventually, word reached the Elves that they had been deceived and the Elven-smith Celebrimbor who had forged the Rings of Power realized that if he did not hide the Three Rings of the Elves, they would be taken by Sauron. Celebrimbor distributed his Rings: he gave Vilya, the Ring of air, to Gil-galad; he gave Nenya, Ring of water, to Galadriel; and finally he gave Narya, Ring of fire, to Cirdan the Shipwright. In 1695, Sauron gathered his evil armies and attacked the Elves' homeland in Eregion and he engaged the Elves in the War of the Elves and Sauron. Eregion was destroyed during the war, and Elrond led the remainder of the Elves of Eregion to Rivendell in the north. A kingdom was established there, and in 1697 it was chosen to become the Elves' new homeland. Elrond ruled Rivendell from the Last Homely House. Sauron's forces continued to plunder Eriador, but they were unable to capture Rivendell or Lindon. In 1700, the Elves received aid from a fleet of Numenor which arrived in 1700 to remove the forces of Sauron from Eriador. In 1701, the Elves decided that Rivendell would remain the Elves' only stronghold in the eastern half of Eriador. During a council held in Rivendell in 1701, the Elves decided that Elrond would act as vice-regent for Gil-galad. It is not known when exactly Elrond received Vilya from Gil-galad, but it may have been during this council. In 3430, Elves and men from Gondor and Arnor united under one banner to oppose Sauron. In 3431, they marched to his realm of Mordor to challenge him. There, Elendil, High King of Gondor and Arnor, was slain by Sauron. Gil-galad was killed as well. Isildur, son of Elendil, defeated Sauron, taking the One Ring for himself and becoming High King of Gondor and Arnor. Because Isildur did not destroy the One Ring in Mount Doom while he had the chance, the evil spirit of Sauron was allowed to live on. Elrond attempted to convince Isildur to destroy the Ring, but he was unsuccessful in doing so. In year 2 of the Third Age, Isildur and his sons were slain in the Gladdan Fields by Orcs who were drawn to the power of the Ring, and the Ring was lost in the Anduin. Valandil, son of Isildur, had not been present during the disaster at Gladden Fields and he inherited the rule of Arnor while Meneldil, grandson of Elendil, ruled Gondor. As the ages moved on, the power of the two kingdoms fell. The power of men was rapidly waining. 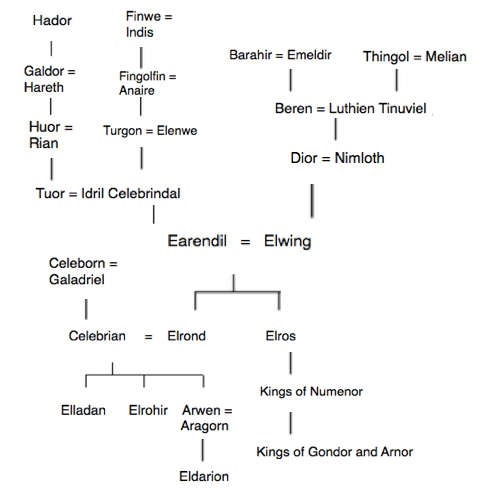 Because Isildur was descended from Elrond's brother Elros, he and Elrond were distantly related. Elrond always sought to give help to the heirs of Isildur. Though it seemed that men were without courage or strength, Elrond knew that one day men would redeem themselves, and it would be an heir of Isildur who would lead them to do so. Elrond married Celebrian, daughter of Galadriel and Celeborn, in 109 of the Third Age. Celebrian bore Elrond three children: twin sons Elladan and Elrohir born in 130, and Arwen born in 240. Celebrian lived with her husband in Rivendell, but she frequented Lothlorien to visit her parents. Elrond became an expert about Elven history and lore as well as about the history of Middle-Earth as a whole. Elrond wrote multiple books during his time as Lord of Rivendell concerning Middle-Earth and its long, marred history. At some point during the 1300s of the Third Age, the Witch-King, Lord of the Nazgul, founded his realm of Angmar in Eriador. The Witch-King gathered large forces to him and in 1409 he attacked the Dunedain in Arnor. Elrond brought aid from Rivendell and he was joined by the forces of Cirdan from the Grey Havens. Ultimately it was Glorfindel who drove the Witch-King out of Angmar in 1975. After the Battle of Fornost, the Dunedain suffered heavy casualties and they became Rangers. Instead of Kings, the Dunedain were now led by Chieftains of the Dunedain, and each Chieftain would be sent to Rivendell to be fostered by Elrond before they could return to Arnor to lead their people. The Chieftains of the Dunedain guarded sacred heirlooms of both Elves and men including the Ring of Barahir, the Elendilmir, the shards of Isildur's broken sword Narsil, and the Sceptre of Annuminas. In 2463, a council of the wisest of Elves and Wizards known as the White Council was formed to discuss the evil presence in Dol Guldur in Mirkwood. The Council included the wisest of beings including Elrond, Galadriel, Celeborn, Gandalf, and Saruman. In 2539, Elrond's wife Celebrian was traveling to Lothlorien to visit her parents Galadriel and Celeborn. She was attacked by Orcs in the Misty Mountains and eventually rescued by her sons. But Celebrian was emotionally wounded. Elrond advised his wife not to remain in Middle-Earth. He thought it wiser for her to retire to the Undying Lands in the West. In 2510, Celebrian took a ship to the Undying Lands. In 2851, Gandalf summoned another gathering of the White Council and he confirmed that the evil presence in Dol Guldur in Mirkwood was indeed Sauron. Gandalf encouraged the Council to attack Dol Guldur, but Saruman assured the Council that the One Ring had washed into the Sea, and the Sauron was powerless without it. In 2933, Chieftain Aragorn and his mother Gilraen came to live in Rivendell. Elrond called Aragorn "Estel," meaning "Hope." Elrond cared for Aragorn very much. In 2941, Rivendell was visited by thirteen Dwarves of Thorin and Company and the Hobbit Bilbo Baggins. Elrond told Thorin that the swords he had taken from the Trollshaws were Glamdring and Orcrist, ancient heirlooms from Gondolin. Elrond was also able to decipher the moon-words that could only be read under the light of the moon on the map of the Lonely Mountain. Later in 2941, the White Council held another gathering. It was unanimously decided to attack Dol Guldur. It was the devices of Saruman that drove Sauron out, but Sauron relocated to his ancient realm of Mordor. Sauron made this claer to the Council in 2951, and in response the council held another meeting. But Saruman told the Council that the Ring was at the bottom of the Sea, and Sauron could never hope to find it. In 2951, Elrond informed Aragorn that he was the heir of Isildur. Aragorn was growing up to be very strong and honorable, and Elrond was proud. But Aragorn soon revealed to Elrond that he was in love with his daughter Arwen, to which Elrond did not approve. Elrond told Aragorn that Arwen would soon be presented with a choice: either the life of a mortal man in Middle-Earth or forever life across the Sea in the Undying Lands. If Arwen were to choose a mortal life, Elrond would be parted with his daughter forever, and if she choose immortality she would have to go to the Undying Lands, never to return. Thus, Elrond advised against the marriage because he did not wish to part with his daughter for eternity. In 2980, Aragorn and Awen were betrothed in Lothlorien. When Aragorn told Elrond, he was displeased, and he told Aragorn that Arwen would marry no mortal man lower than the High King of the Reunited Kingdom of Gondor and Arnor. But Aragorn was the heir of Isildur, so it was possible for him to reclaim this position. In 3002, the Hobbit Bilbo Baggins came to live with Elrond, and Elrond required the return of his daughter Arwen from Lothlorien in 3009 because Sauron's power was growing in the Misty Mountains. The company of the One Ring, Frodo, Sam, Pippin, and Merry, arrived in Rivendell in October of 3018. Gandalf had arrived only several days before, and he told Elrond that Saruman had joined with Sauron. Elrond was also alerted about Frodo's wound in his shoulder. Elrond worked on slowing the poison of the Morgul-blade from spreading to other parts of Frodo's body. Elrond cured Frodo for the most part, but the wound would never fully heal, and even after the destruction of Sauron it would remain. The Council of Elrond gathered on October 25, 3018 to discuss what to do with the One Ring. Though there were differing ideas, it was ultimately decided that the Ring would be destroyed in Mount Doom in Mordor, where it was made. A fellowship of nine companions was formed to destroy the Ring. On December 25, 3018, the Fellowship set out for Mordor. In February of 3019, Elrond sent his twin sons to join the company of Aragorn in Dunharrow. From there, Aragorn would take the Paths of the Dead and summon the Dead to fight for him in the Battle of the Pelennor Fields. The Dead were successfully summoned in March of that year, and they marched south to Pelargir where they overtook the Corsairs' ships, and Elrond's sons sailed north with Aragorn to Minas Tirith where they helped the people of Gondor win the Battle of the Pelennor Fields. Elrond had advised his sons to march upon the Black Gate with a Host of the West to give Frodo time to destroy the Ring and Sauron along with it. Gandalf came to this same conclusion in Minas Tirith, and it was decided that the Host of the West would engage the enemy in the Battle of the Morannon. The Host of the West fought valiantly until the Ring was destroyed on March 25. Along with the Ring, Sauron's realm fell and was destroyed. The coronation of Aragorn took place on May 1 of 3019. Elrond was ready to allow his daughter to marry Aragorn rather than living an immortal life in the West, for he had promised Aragorn that he would allow Arwen to marry him if he was crowned High King of Gondor and Arnor. Later that day, Elrond and his daughter went to Minas Tirith, and on Mid-year's Eve they arrived at the city. Elrond gave Aragorn with the Sceptre of Annuminas, and with it Arwen. Arwen and Aragorn were wed the following day. Elrond and Aragorn attended the funeral session of King Theoden at Edoras in August. There, Elrond and his daughter bid one another one last farewell, and Arwen left to return to Gondor while Elrond returned to Rivendell. Elrond returned to Rivendell in the company of Gandalf and the Hobbits Frodo, Sam, Pippin, and Merry. Elrond could tell that Frodo would not be at ease in Middle-Earth, and he told him to meet him in the woods in autumn. Elrond and Frodo were reunited on September 22, 3021 in the Woody End. On September 22, 3021, Elrond met Frodo in the Woody End in the Shire. From there, they rode together to the Grey Havens, and from there they would leave Middle-Earth in the company of Gandalf, Bilbo, Galadriel, and Celeborn. On September 29, after having lived in Middle-Earth for over 6,000 years, Elrond passed over the Sea into the Undying Lands, presumably to be reunited with his wife and maybe even his parents. The Return of the King: "The Battle of the Pelennor Fields;" "The Last Debate;" "The Field of Cormallen;" "Many Partings;" "The Grey Havens"
The Silmarillion: "Of the Voyage of Earendil," passim; "Of the Rings of Power and the Third Age"
The Unfinished Tales: "The History of Galadriel and Celeborn"
Elrond and Elros were born as the sons of Earendil and Elwing. After an invasion of the Havens of Sirion, Elrond and Elros were captured by Maglor, son of Feanor. Their parents worried that they would be killed, but Maglor spared them. After the War of Wrath was won with the aid of the Valar, the great enemy Morgoth was banished from the world and the First Age ended. Gil-galad and Elrond became allies, and they settled Lindon in northern Middle-Earth. Elros was crowned the first King of Numenor after choosing to lead the life of a mortal man. Elros died in Numenor, his reign being one of the greatest of the Kings of Numenor. Sauron tried to enter Lindon in a fair disguise. Elrond and Gil-galad rightly did not trust him, so they refused him entrance. Sauron found his way into Eregion and the Elven-smiths there helped him forge the Rings of Power. The Three Rings of the Elves, the Seven Rings of the Dwarves, and the Nine Rings of Men were all forged. Sauron created the One Ring to rule them all, and the Elves realized that they had been deceived. After Sauron declared war on the Elves, they hid the Three Rings of the Elves. Sauron attacked the Elven realm of Eregion and Elrond stood against him. Eregion was destroyed by the forces of Sauron and Elrond founded Rivendell for the Elves who survived the fall of Eregion. Sauron's forces conquered the entirety of Eriador. A fleet form Numenor arrived in Eriador to drive out the forces of Sauron. Sauron was temporarily. A meeting was held in Rivendell and the Elves agreed to nominate Elrond as vice-regent of Eriador to the regent Gil-galad. It was also decided that Rivendell would remain the only Elven stronghold in eastern Eriador. The men of Gondor and Arnor formed an alliance with the Elves, an alliance that would by remembered as the Last Alliance. The Last Alliance of Elves and men gathered their forces in Rivendell. The allied forces of Elves and men marched upon Sauron's realm of Mordor and the War of the Last Alliance began. Sauron's forces were defeated in the Battle of Dagorlad and the Elves and men advanced into Mordor and put Sauron's tower of Barad-dur under siege. After slaying both Gil-galad and Elendil, Sauron was defeated by Isildur. Isildur took the One Ring for himself, despite Elrond's actions to try to convince him to throw it into the fires of Mount Doom. Because Isildur took the Ring, Sauron's spirit was allowed to live on. Isildur was killed in the Gladden Fields by Orcs attracted to the power of the One Ring. The One Ring was lost in the Anduin. One of Isildur's squires Ohtar brought the shards of Narsil to Rivendell. Elrond was wed to Celebrian, daughter of Galadriel and Celeborn of Lothlorien. Celebrian bore Elrond twin sons named Elladan and Elrohir. Elrond and Celebrian had a daughter named Arwen. The Witch-King, Lord of the Nazgul, declared himself Lord of Angmar. Angmar was located in Eriador, and this geographical location threatened both Elves and men. Elrond led an army of Elves from Rivendell to aid the men of Arnor in their war against the Witch-King. The combined forces of Elves and men defeated the Witch-King in the Battle of Fornost. The Ring of Barahir, the Sceptre of Annuminas, and the Elendilmir, items sacred to the Dunedain, were sent to Rivendell to be looked after by Elrond. A Council of the very wise known as the White Council was made to adress the evil presence in Dol Guldur in Mirkwood. Elrond became part of the Council along with Galadriel and Celeborn and the Wizards Gandalf and Saruman. The Council suspected that the evil presence in Dol Guldur was Sauron. Celebrian was kidnapped and tortured by Orcs when traveling passed Redhorn Gate to visit her parents in Lothlorien. Though she survived the attack, she was emotionally disturbed. By the counsel of her husband, Celebrian left Middle-Earth and passed over the Sea into the Undying Lands. The White Council met for the second time. Gandalf confirmed that the evil presence in Dol Guldur was indeed Sauron. Gandalf encouraged the White Council to strike Dol Guldur, but Saruman assured them that the One Ring had been lost in the Sea, and Sauron was powerless without it. As he had done with all Chieftains of the Dunedain, Elrond fostered Aragorn at his home in Rivendell. Summer: Thorin and his company of twelve Dwarves, a Hobbit, and a Wizard arrived in Rivendell. Elrond showed the Dwarves how to read their map of the Lonely Mountain, and he also told the Dwrves that their swords were the swords Orcrits and Glamdring of Gondolin. Autumn: The White Council met once again, and they unanimously agreed to strike Sauron in Dol Guldur. Sauron fled Dol Guldur, but he would soon reclaim his lost realm of Mordor. Date Unknown: Sauron re-established himself in his former realm of Mordor. May 1: On their return journey from the Lonely Mountain, Gandalf and Bilbo visited Elrond in Rivendell. Dates Unknown: Sauron openly revealed himself to be in Mordor. After Elrond told Aragorn he was Isildur's heir, Aragorn fell in love with Arwen. Elrond wasmost displeased because his daughter was immortal and Aragorn was not. The White Council met for one last time. Saruman falsely informed them that the Ring had flowed down the Anduin and into the Sea, and explained how Sauron would be powerless without it. In Lothlorien, Aragorn and Arwen were betrothed, but Elrond told them they could not marry until Aragorn became High King of the Reunited Kingdom of Gondor and Arnor. Bilbo came to live with Elrond in Rivendell. Elrond requested that Arwen return home from Lothlorien due to the growing threat Sauron's servants posed in the Misty Mountains. October 8: Elrond's scouts reported that Frodo Baggins was coming to Rivendell with the One Ring. He was wounded, and the Nine Nazgul were pursuing him. October 9: Elrond sent Glorfindel to find Frodo and bring him safely to Rivendell. October 20: Elrond made the waters of the Ford of Bruinen wash out the Nazgul and drown their horses. October 23: Elrond removed the shards of the Morgul-blade from Frodo's shoulder..
October 25: The Council of Elrond decided that the One Ring must be destroyed in the Mount Doom. December 18: Elrond announced the nine members of the Fellowship of the Ring. December 25: The Fellowship of the Ring departed Rivendell and headed south. February: Elrond sent his twin sons south to help Aragorn in the Battle of the Pelennor Fields. May 1: Coronation of Aragorn. Though Elrond and his daughter did not attend, they headed south that very day. Elrond was prepared to allow Aragorn to marry Arwen. May 20: Elrond and Arwen spent the week with Galadriel and Celeborn Lothlorien. May 27: Elrond and Arwen departed Lothlorien and headed south to Gondor. June 14: Elrond and Arwen reunited with Elladan and Elrohir. They traveled to Edoras. June 16: Elrond and his children set out for Minas Tirith. Midsummer's Eve: Elrond gifted Aragorn with the Sceptre of Annuminas, a symbol of Aragorn's new kingship of Arnor, and the hand of Arwen in marriage. Midsummer's Day: Arwenand Aragorn were married in Minas Tirith. Elrond attended the wedding. July 22: Elrond and his daughter departed Minas Tirith to attend the funeral of King Theoden of Rohan. August 14: After the funeral, Elrond and Arwen bid each other one final farewell before parting forever. August 22: Elrond returned to Rivendell. October 5: Elrond blessed Frodo and told him in the Woody End next autumn. September 22: Elrond and Galadriel were reunited with Frodo in the Shire. From there, they rode to the Grey Havens in an event known as the Last Riding of the Keepers of the Rings. September 29: Elrond passsed over the Sea into the Undying Lands in the company of Galadriel, Celeborn, Frodo, Gandalf, and Bilbo. When Elrond arrived in the Undying Lands, he was presumably reunited with his wife Celebrian. Elrond is of uncertain meaning. It contains the elements el meaning "star" in Quenya and rond meaning "vaulted." This may thus translate as "vaulted star." 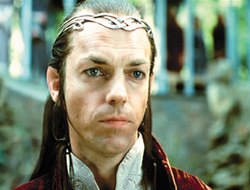 Because of his authority, Elrond was also called Master Elrond and Lord Elrond of Rivendell. Because Elrond was only part Elven, he was called Half-Elven. The Elvish term for this was either Peredhel or Peredhil. Elrond was precisely 56.25% Elf, 37.5% man from his grandfather Tuor and his great-grandfather Beren, and 6.25% Maia from his ancestor Melian, but since he had the choice between Elves and men, he became purely Elven. Elrond was appointed vice-regent of Eriador by Gil-Galad, regent of Eriador. A vice-regent is a person who acts as an authoritative figure if the regent is not present.